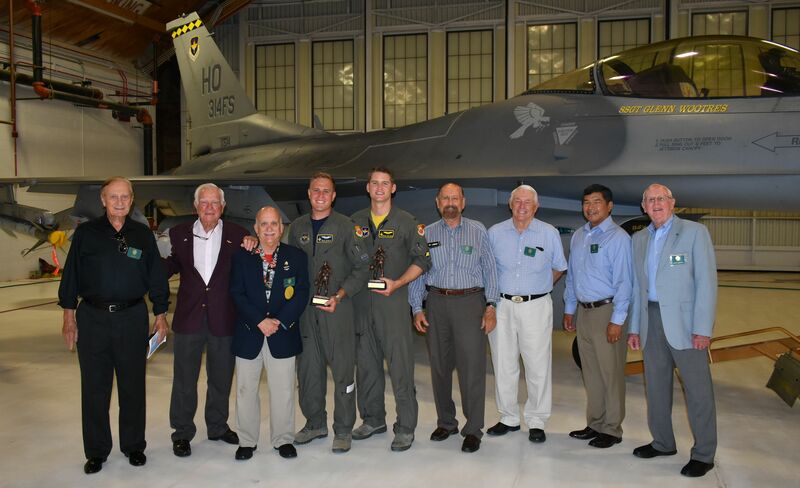 Daedalian Flight 24 Captain, Roger Nichols, and Vice Captain, Ric Lambart, both long time active FASF members, once again had the privilege of presenting Leadership Awards to graduates of the Air Force F-16 Fighting Falcon programs at Halloman Air Force Base (HAFB) near Alamagordo, NM, earlier this month. 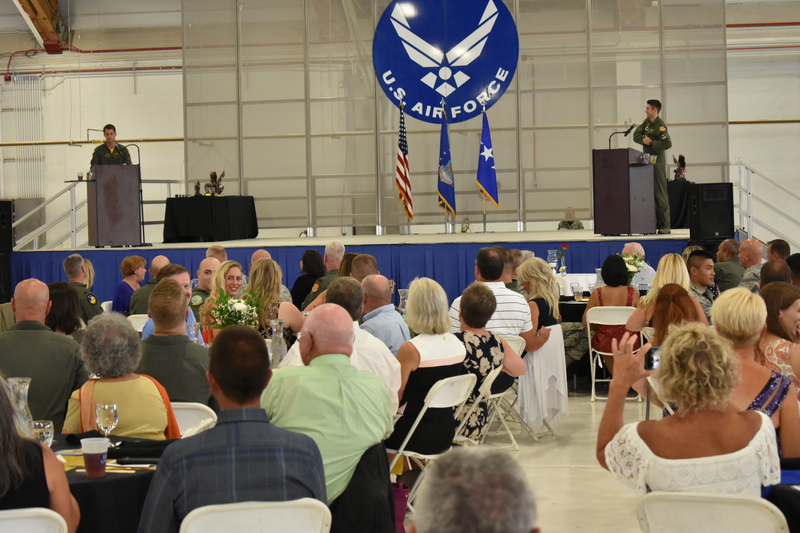 Other Daedalian Flight members, all from El Paso, Texas, also attended the gala event, at which the principle guest speaker, Four Star General James M. Holmes, himself once a USAF Fighter Pilot, gave an inspiring address to the graduates, their instructors, parents and friends. 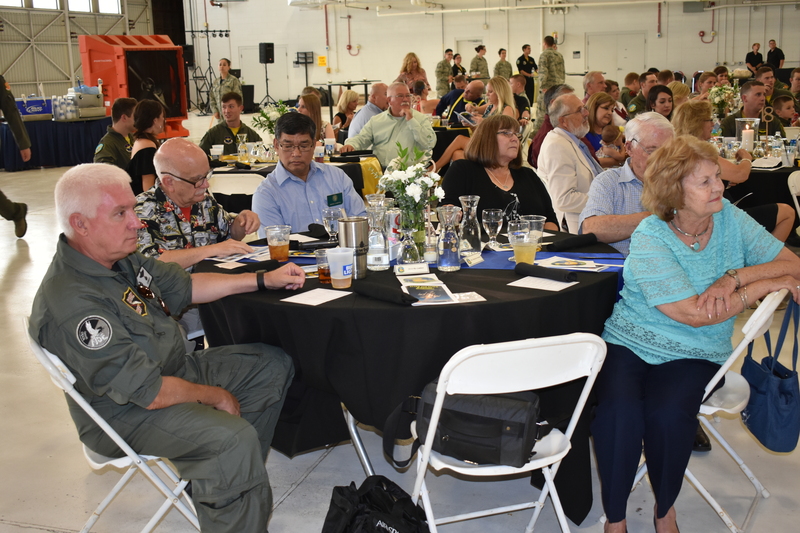 Other Daedalians at the event also included Colonel Mario Campos and his wife, Judy, Colonel Bob Pitt and wife, Julie, Virg Hemphill and wife, Jenine, Charlie Overstreet and wife, Mayre Sue, and Jerry Dixon. Virtually all the Daeedalian Society members from the El Paso Flight are also long time FASF members. 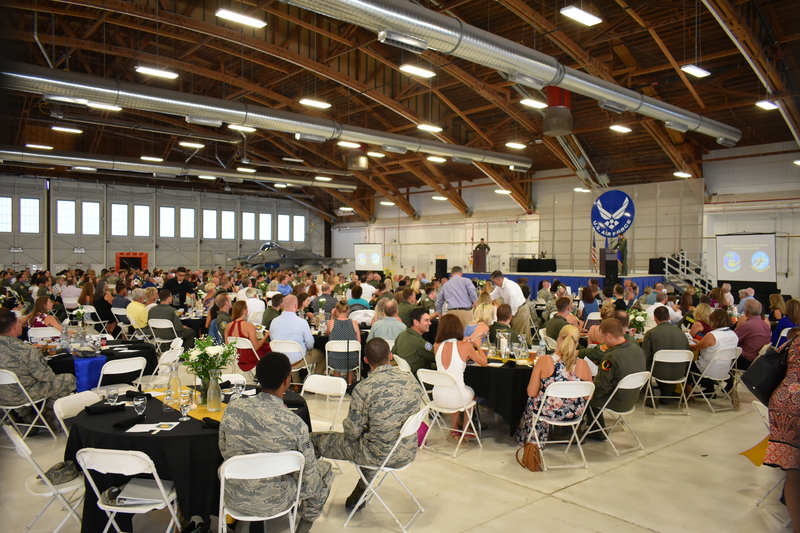 For the first time, HAFB combined two fighter squadrons into one graduation ceremony, which was held in one of the Base’s large aircraft hangars. 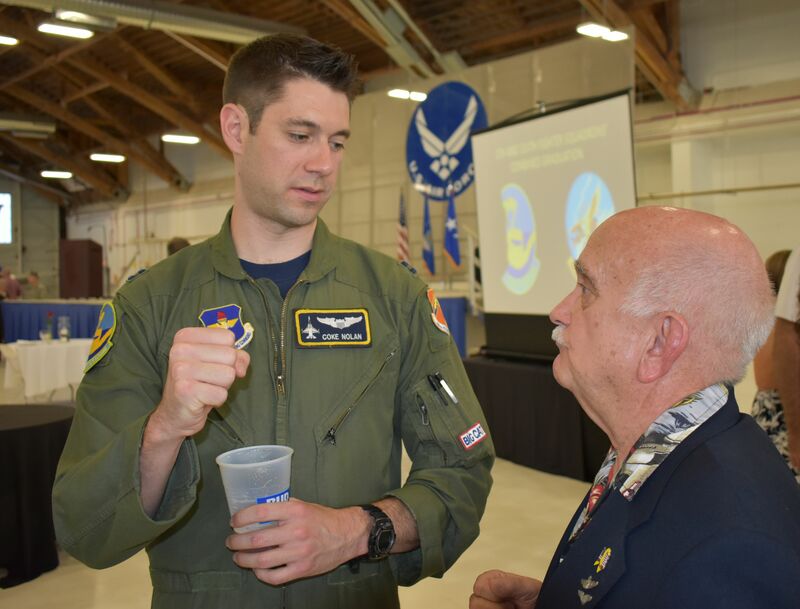 Approximately 400 graduates and guests attended the ceremony, which included the 311th and 314 Fighter Squadrons. 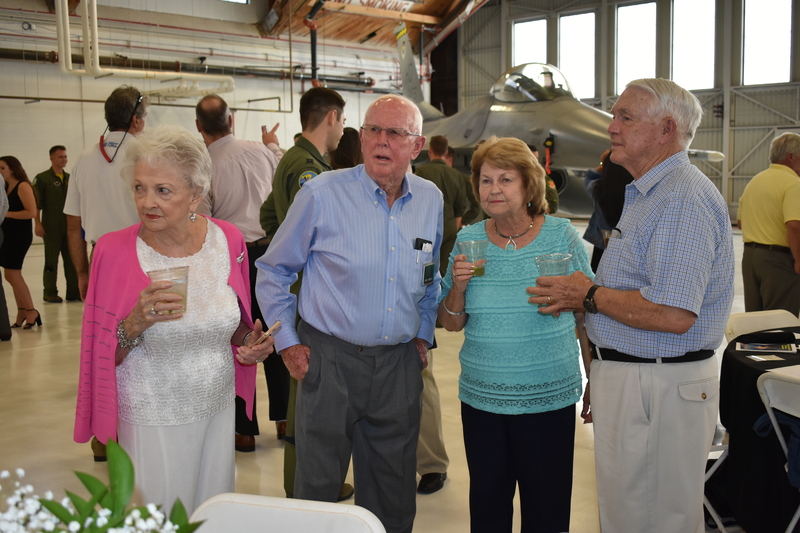 Captain Coke Nolan, at left, one of the two MC’s for the event talking with Daedalian Flight Captain, Roger Nichols . .
L to R above: Jenine and Virg Hemphill, Mayre Sue and Charlie Overstreet. 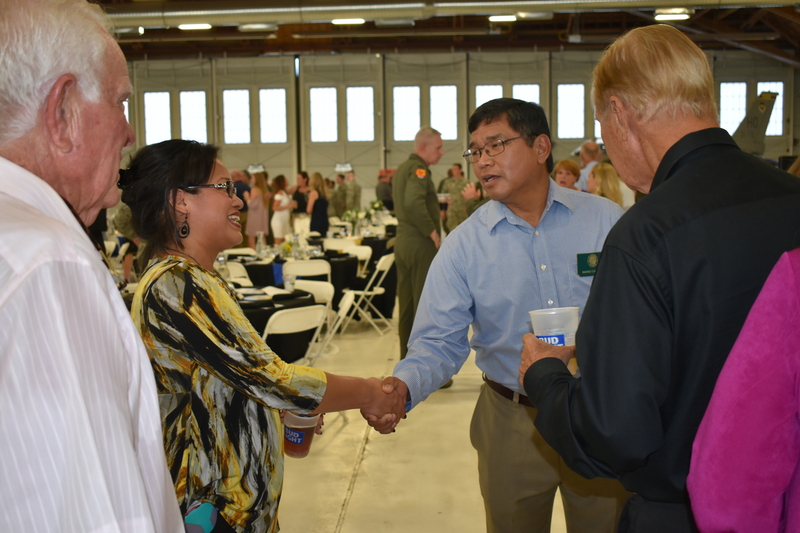 L to R: Jerry Dixon, MJ Tucker of HAFB, who handled the graduation details, greeting Colonel Mario Campos, while Colonel Bob Pitt looks on. 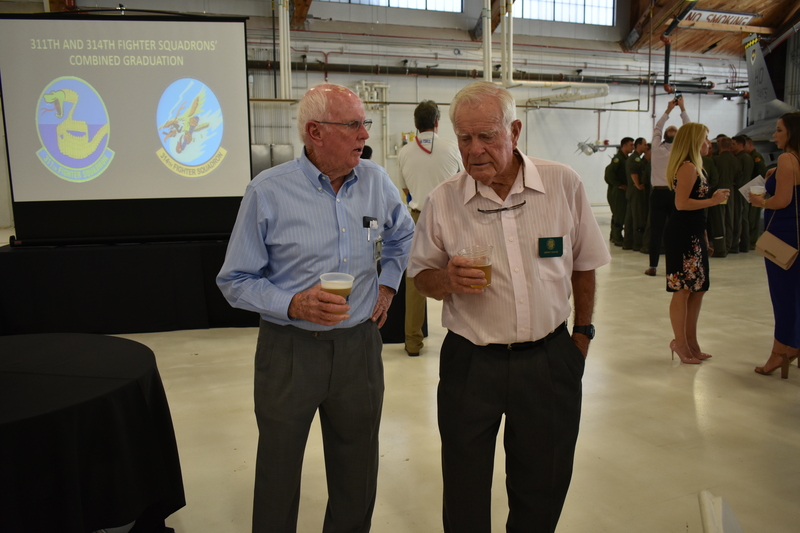 L to R: FASF Aviation News Scouts and Daedalians, Virg Hemphill and Retired USMC Aviator, Jerry Dixon. View of the stage and the two MC’s busily running through their smooth routine before the audience. L to R: Judy Campos, Julie Pitt, Roger Nichols, Bob Pitt, Ric Lambart, Charlie Overstreet and Mario Campos. Again, View of the stage and the two squadron MC’s animatedly running through their amusing routines before the audience. One of the two Daedalian Tables with, L to R: Ret. 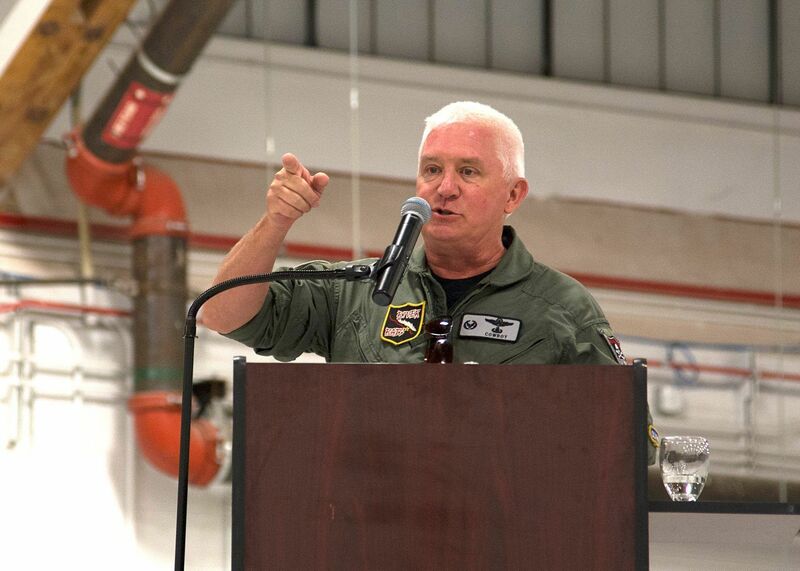 USAF Fighter Pilot, Col. Miles “Cowboy” Crowell, Roger Nichols, Mario and Judy Campos, Charlie and Mayre Sue Overstreet. 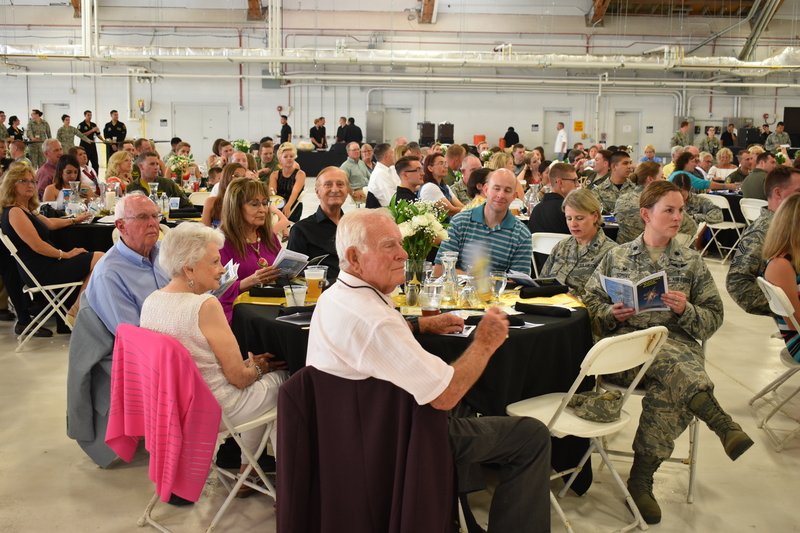 The other Daedalian Table, with ((Clockwise from front Left: Jerry Dixon, Jenine and Virg Hemphill, Julie and Bob Pitt, newly retired fighter Pilot and his still active duty USAF Flight Nurse wife, and another Flight Nurse. Graduates and guests begining to fill their plates for dinner. 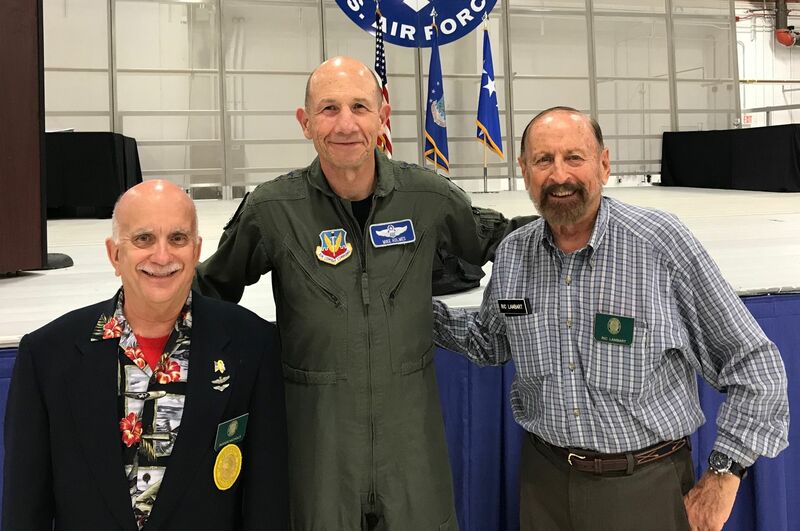 L to R: Colonel Jeff “Tank” Patton congratuting the 311th Squadron’s winner of the “River Rat” award, and co-presenter, retired USAF Col. Cowboy Crowell. 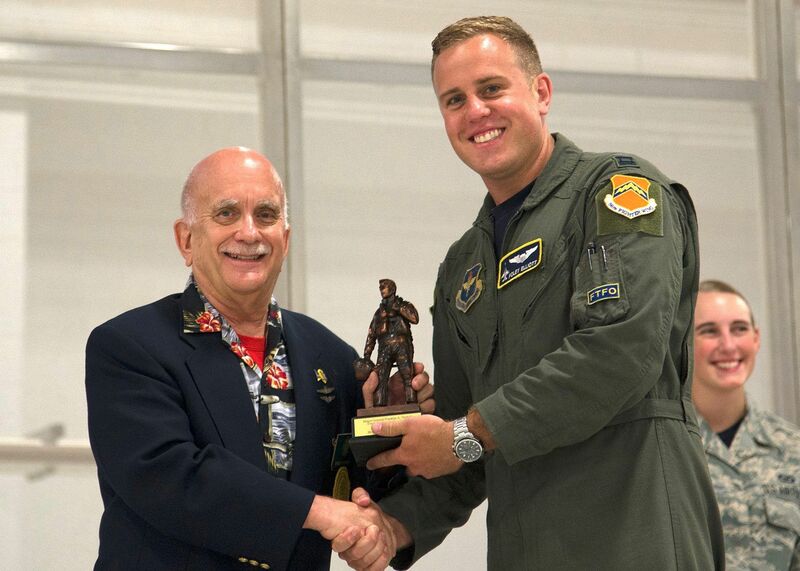 L to R: Roger Nichols presents Daedalian Leadership Award to Capt. 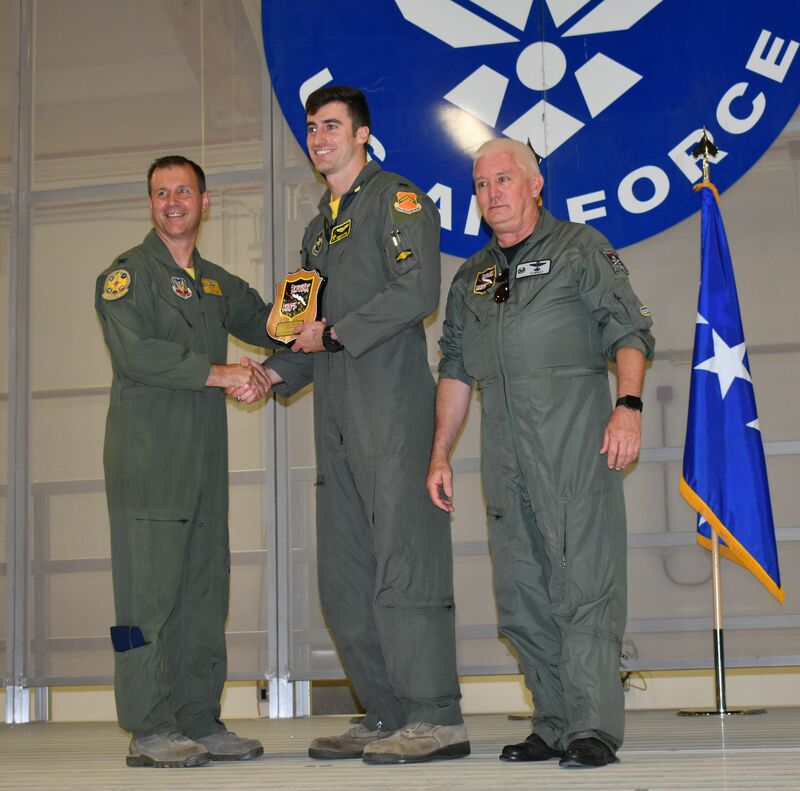 Foley Elliot, F-16 graduate from the 311th FS. 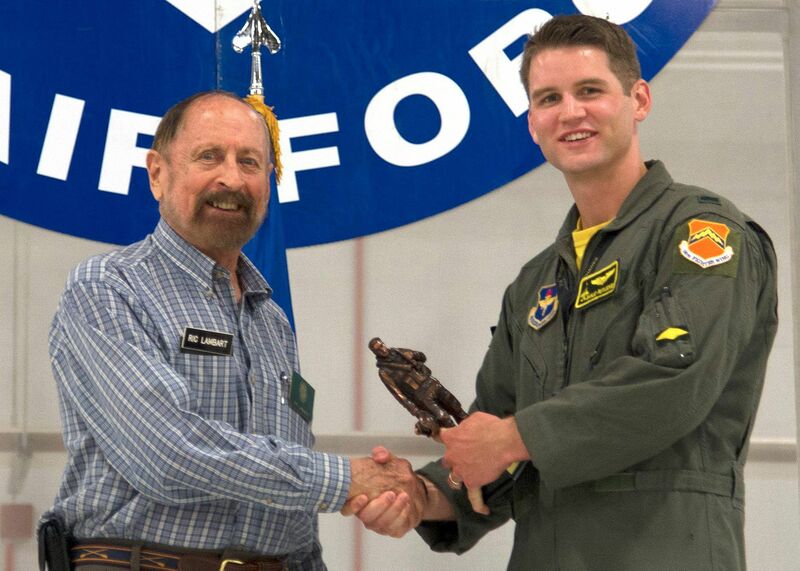 L to R: Ric Lambart congratulates the 314th Fighter Squadron’s Lt. “Banjo” Rutledge on his Leadership Award. Daedalians all, Lto R: Bob Pitt, Jerry Dixon, Roger Nichols, Capt. Foley Elliot and Lt. Banjo Rutledge, Daedalian Awardees, with Ric Lambart, Charlie Overstreet, Mario Campos, and Virg Hemphill. Daedalian, Colonel “Cowboy” Crowell describes the hiostory of the “River Rat” award, which has its roots back during the Vietnam conflilct. L to R: Roger Nichols, General James M. Holmes, and Ric Lambart. This entry was posted in HOT NEWS! and tagged 311th and 314 Fighter Squadrons, Bob and julie Pitt, Capot. Coke Nolan, Capt. 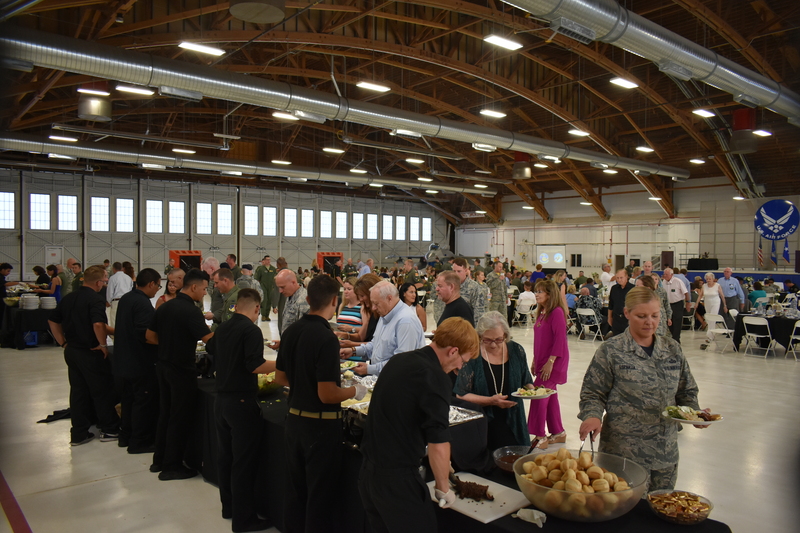 Foley Elliot, Col. Jeff "Tank" Patton, Cowboy Crowell, Daedalian Leadership Awards, Daedalians, FASF Members, Gen. James M. Holmes, Graduation, Jenine and Virg Hemphill, Jerry Dixon, Lt. Banjo Rutledge, Mario and Judy Campos, Mayre Sue and Charlie Overstreet, MJ Tucker on July 30, 2018 by FASFRIC.